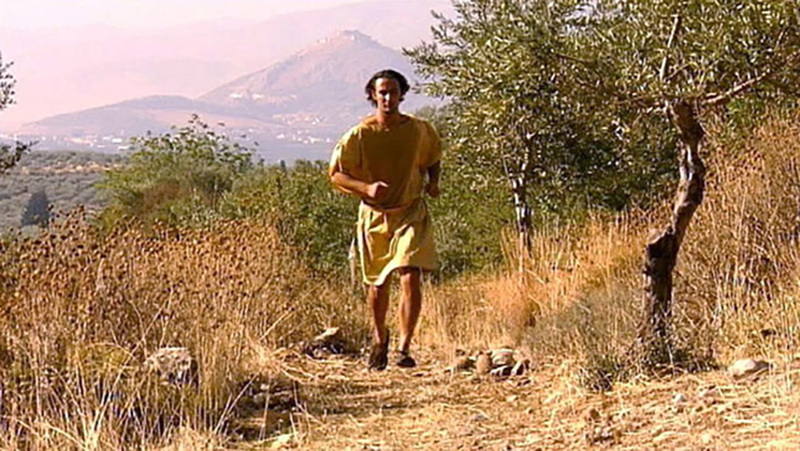 Recreation of the report by Herodotus of the Athenian Pheidippides running to from Athens to Sparta to call for help against the Persians advancing to the Battle of Marathon (hence the name for a long race – a marathon). The period in which the Greek poleis were left essentially to their own devices came to an end with the clash between the Persian Empire and some of the Greek city states, but which came to involve Athens at the famous Battle of Marathon in 490, and I’d like to tell you today about the rise of the Persian Empire, and its conflict with the Greeks, and concluding with the account of that battle. First, some terminology. The Persians were what the Greeks called them and that was appropriate. They were very close cousins of the people, who lived right next to them or among them, called the Medes. In fact, the Medes were the first of that group — I guess we could call them Aryan peoples. Again, that’s a term that has been abused throughout the nineteenth and twentieth century, as though it was a racial group. The term is a linguistic one, and they spoke a branch of the Indo-European family of languages, which is designated as Aryan, and that’s all that that really means, but they’re very, very close. In fact, the Greeks really couldn’t distinguish between the Persians and the Medes, and so they called them sometimes Medes, and sometimes Persians. It really doesn’t matter because, although the Medes took the lead in forming a national kingdom out of a tribal society and were the first to be the dominant family on the Iranian plateau where these people finally settled down, the Persians then overthrew them and established themselves as the ruling group in that family under Cyrus the Great, as he was called back probably in 559. 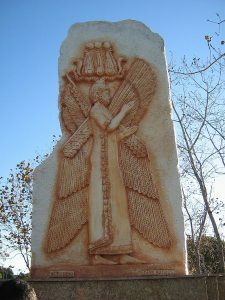 He was called Cyrus the Great, because he was a great conqueror, first making his tribal associates the Persians, the dominant force in Iran and then expanding the extent and the power of what we can now call the Persian Empire, an extraordinary distance. If we look at the end of the lifetime of Cyrus, one man’s lifetime, is when this extraordinary expansion, much of it, most of it, takes place. If you look at the Near East in the year 550 B.C. 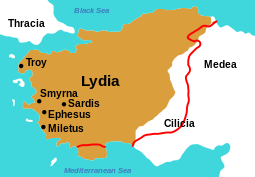 what you find is the Kingdom of Medea, the Kingdom of Babylonia, which is the most powerful one in the Tigris Euphrates Valley, what is now Iraq, the Kingdom of Lydia occupying sort of the western portion of Asia Minor, excluding at first the coast, which was occupied by Greeks, but which the Lydians then conquered the Greeks in the 540s — that’s the picture. Then there is the people of Persia, the Persians themselves who are of not much account. 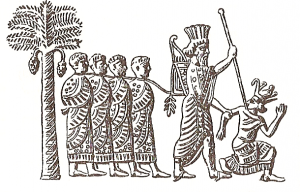 But when Cyrus becomes King in 559 he is a member of the dynasty which is the Achaemenid Dynasty, and he conquers his fellow Aryans, the Medes in about 550, and very swiftly conquers Babylonia, Armenia, Syria, Cappadocia, which is another kingdom in central Asia Minor, and has already expanded this kingdom to something pretty much unexampled up to that time. Now, meanwhile in Lydia, the dynasty that began back in the seventh century, finds that the King Croesus is the monarch at that point. You will have remembered, of course, that Herodotus’ first book pretty much begins its story with King Croesus, and his decision to attack the Persian Empire which is now on his frontier. You all remember the story that Herodotus tells so charmingly – the story of how Croesus decides he wants to conquer the Persian Empire, consults the Oracle of Apollo at Delphi to see how he’s going to make out; the oracle gives a characteristically enigmatic answer, but he doesn’t recognize the enigma. He says, “What will happen if I cross the Halys River,” that’s the boundary between Lydia and the Persian territory. 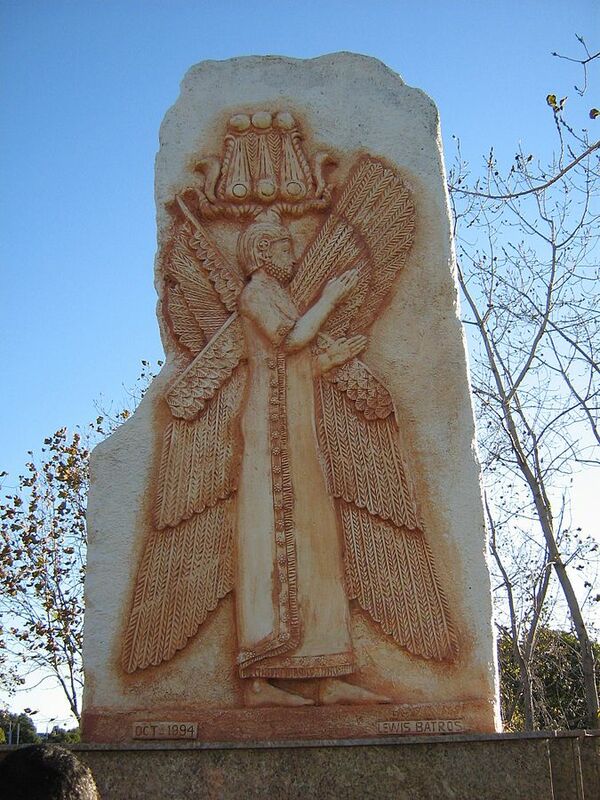 The oracle answers, “A great empire will be destroyed,” and of course he had in mind, destroying the Persian Empire. Instead the Persians destroyed his empire, and of course, that shows you you’ve got to ask the right question and keep answering it until you get an answer you understand. Well, Croesus attacks in 547; his capital of Sardis falls into the hands of the Persians in the next year, and so now the Persians are in control of the Lydian Empire and on the frontiers of the Greek cities on the coast of Asia Minor. The conquest of those cities takes place in the years 546 to 539; 539 is a very big year for the Persians, because in that year they conquer the city of Babylon, and thereby gain control of all of Mesopotamia, another one of the major expansions of this vast empire. The successor to Cyrus is Cambyses and in the years between 530 and 522, he conquers, amazingly enough, the Kingdom of Egypt. Perhaps the oldest, but if not, almost the oldest of the kingdoms of that region, fantastically wealthy, and in its own right formally a great empire. Now, if you stop in 522, when Cambyses dies, you see that the Persian Empire extends on the west from the Aegean Sea and the Mediterranean Sea to the west, all the way to the Indus River in what is now Pakistan. From the south really to what is now Sudan at the southern end of the Nile River, and up north to include the European coast of the Hellespont and the region and the waters of the straits, and the European coast of the Aegean Sea and he comes right up as far as the Danube River, nor is that the end of what he would like to do. Cambyses launches an invasion of the territory beyond the Danube, which was not in the shape of any kind of a national kingdom yet, just an area filled with different kinds of tribes which the Greeks called Scythians, pushing all the way back into Russia, all the way back to the Caucuses Mountains and perhaps beyond. 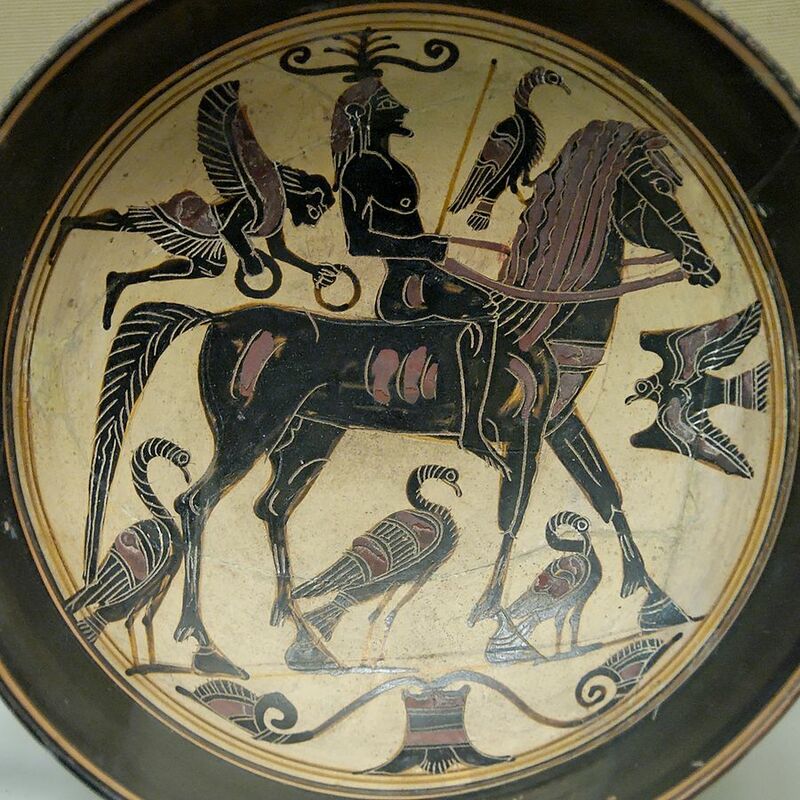 These horse-riding, tribal people called the Scythians, who didn’t even really engage in agriculture, but were still in the business of living off herds of animals. Well, the expedition goes forward, and it ends up gaining the straits in Macedon, as I told you before, or I should have told you those names anyway. The story is told that one of the generals of the Persian army is a certain Miltiades. Miltiades was originally an Athenian, but his family had been expelled in the time of the tyrant — or rather they had been sent to govern the Gallipoli Peninsula, the Thracian Chersonnese as the Greeks called. So, he lived up there, and then when the Persians came and took that territory, he became a subject of the great king and he became a general in the great king’s army. He and some others were given the task of guarding the bridges across the Danube, while the king was chasing Scythians on the other side. 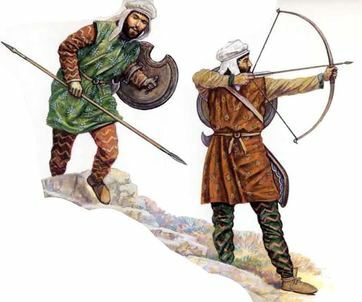 Well, he was unable to defeat the Scythians, who used Scythian tactics, which is to say, on cavalry, stayed away, avoided a direct conflict and did damage with missiles at a distance and ran away when they were about to face a great Persian army which could defeat them. So, he was gone a long time, and while he was gone, Miltiades said, “He’ll never come back. Why don’t we just break down these bridges to make sure he never gets back, and then we’ll be free of the Persians.” Well, it didn’t work out that way and the Scythian campaign didn’t succeed, but the Persian army came back and Miltiades had to run off and escape, because there was certainly a price on his head, and he ended up going back to Athens where we will run into him again. So that is the situation when we get to the turn of the fifth century. The Persians are in control, they have gained mastery of all the Greek states of Asia Minor. The typical relationship between those cities and the King of Persia was the same as all of his subjects. He insisted, in every case, that the defeated states who came under his power should give earth and water to him as a symbol of their complete subjection to him. There was no kind of relationship to the great king, except of one of complete subjugation. The Greeks regarded that relationship as one of slavery. But as a matter of fact, the Persians were not harsh rulers for the most part. All they required of the subject peoples was that they should pay a tribute to the king, and it was obviously not one that couldn’t be met. Obviously, nobody likes to pay a tax, especially to a foreign conqueror, but it wasn’t something that destroyed the economy, and to do military or naval service at his command and under his command as well. So, if you did that, they left you alone. At this point, at the characteristic regime was to have a tyranny appointed by the great king of Persia in each Greek city. Remember, you should use that word in its original concept. It doesn’t mean they were harsh; it doesn’t mean they were particularly cruel. They were satraps, the representatives of the king in the region, and they had absolute control, but we don’t hear about any specially harsh treatment of anybody. That’s the situation, when we will come very shortly to the beginning of conflict between the Greeks of the mainland and the Persian Empire, when the Ionian rebellion breaks out. But before that happens we need to go back to Greece and see what’s going on there. Remember in Athens, the Cleisthenic revolution has taken place. The new hoplite democracy that I have described to you is brand new and very insecure. Fearful that there are enemies within, some of them friends of the aristocratic families that have been defeated and fled, some of them friends, relatives of the tyrants whose loyalty to the new regime is not clear. So, that’s one fear. Another fear is that the Spartans will not accept their expulsion, the expulsion of their friends, but will come back again with an army to try to conquer Athens and turn it over to the aristocrats. Yet, a third problem, Athenian neighbors with whom the Athenians have old quarrels may take advantage of their beleaguered situation and attack them. So, that has to be remembered. Athens is in a very insecure spot, and Herodotus tells us that in these circumstances the Athenians attempt to get help by sending a mission to the king of Persia, asking for an alliance with Persia as a way of fending off these troubles. Of course, the king only knows one relationship with other states. He doesn’t know anything about alliances that have any equality associated with them. He asks the ambassadors of Athens to give him earth and water and then they can be friends. The ambassadors say okay we’ll do that, but when they come back to Athens, the Athenians are outraged that they have done so. They punish the embassy and there is no relationship between Persia and the Athenians. Indeed, what they feared happens. 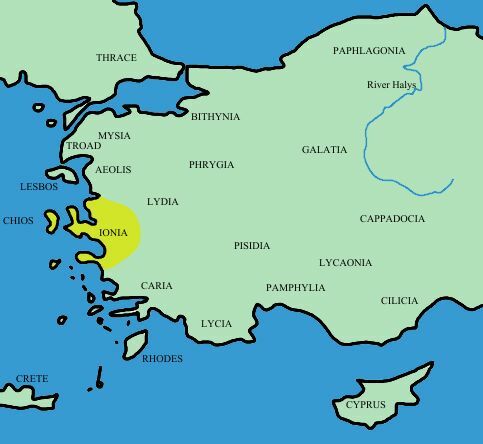 The Spartans invade Attica and as they are doing that, they are joined by other states who have their own grievances with Attica, Boeotia, led by Thebes, Chalcis which is a city in Euboea just to the east of Attica and Corinth just down the road on the isthmus. They are all going to attack the Athenians, but it turns out that the Corinthians balk at this idea, and what they don’t like they say is the notion of installing some kind of a tyranny in Athens. They have had the experience of tyranny, they have expelled the tyranny not so very long ago they claim, and they are not about to join anybody in doing the same thing. So, that’s one source of division that prevents this coalition from attacking the Athenians. But there’s also a quarrel between the two Spartan kings, Cleomenes who has been there before and who very much wants to take Athens and return it to his aristocratic friends, and King Demoratis, who for whatever reason, is not willing to do that. Demoratis loses the argument, charges are brought against him and he flees, and next we will find Demoratis in the Persian Empire at the elbow sometimes of the king, giving him advice as to how to deal with the situation. Well, because of these things, there is no invasion. The Athenians are now free to turn against their neighbors who have threatened them, against the Boeotian cities led by Thebes, against Chalcis and the Athenians defeat their opponents. In Chalcis, on the island of Euboea, the Athenians take away a chunk of land from the Chalcidians and plant 4,000 Athenian settlers on that land, and they do so not as a colony in the traditional sense, not as an apoikia but as what the Greeks call a kleruchy, which is this: these 4,000 Athenians who take the land, settle there permanently, but they remain Athenians. They are still Athenian citizens; they are really functioning as an Athenian garrison to see to it that things in Boeotia are okay. In this way, they very closely resemble the Roman idea of a colony, which was typically a collection of veterans after conquering some other town in Italy, they would take some of that land, give it to Roman legionaries and let them settle permanently there as a garrison on behalf of the Romans. Well, that’s what the Athenians do in the case of Chalcis. Herodotus sort of sings an aria at this point about the wonders of freedom, in which he says the Athenians were no better than any other Greeks at warfare before they became free. But once having liberated themselves from tyranny and establishing this new Cleisthenic regime, they were able to defeat all of their opponents, and so much for Herodotus’ prejudice, but of course as you read his history, you will realize that in one sense at least the history of Herodotus is a paean to the wonders of freedom and the greatness of freedom, and the centrality of freedom as the story of the Greeks. By the way, he also praises not just freedom, eleutheria is the Greek word, but in the case of Athens he praises itsisegoria. That word really means equality of speech. 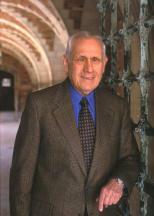 He characterizes this new Cleisthenic regime not by the word democracy, which is apparently not really been coined yet, but rather as what characterizes it, is that all citizens are free, equally able to address the populous in the assembly, and thereby to take an active role in their own government. So he’s really praising autonomy, self government, not merely freedom from an alien people, but freedom within the city for all the people to govern themselves. He thinks that’s one of the reasons why the Athenians have become so good at warfare, because of these changes. Now, a new coalition emerges, also hostile to this new Athenian regime; it includes Athens’ old enemy – the island of Aegina, which sits in the Saronic Gulf, right opposite the Athenian coast and, as I say they, have been fighting each other now for more than a century, and quarreling about this and that. So, the Aeginetans join with the Spartans and now they are openly attempting to destroy this regime and to replace it with a return to the tyranny of Hippeis. 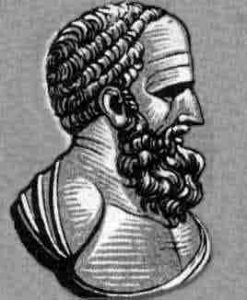 Hippeis has also fled to the Persians and is protected by the king, so that, if the Persians get involved, they too will want to put Hippeis on the throne in Athens, but the Spartans want to do the same thing, and again the Corinthians will have none of that because of their attitude towards tyranny. Now, threatened even more severely, the Athenians send a second mission to Persia, and this time the Persian king makes it very clear that will require that the Athenians to put down their newly established democracy and restore Hippeis to his tyranny in Athens, which would make Athens like the other Greek city states, the ones that are on the coast of Asia Minor, part of the Persian Empire, and Hippeis in his relationship to Persia would be the satrap of the great king governing his own city, which was, I think, commonly what was happening in Asia Minor on the Greek coast too. That’s where we are when the Ionian rebellion breaks out in the year 499. The start comes in the city of Miletus, which was of course a leading city of the Greeks of that area for some long time, a place you will remember that was filled with new ideas where we first hear about the kinds of quasi scientific, but in any case, rationalistic revolution that challenges the traditional Greek way of thinking based largely on mythology and on theology, with pure reason. I don’t want to suggest that the Milesian philosophers were without religion. I’m simply saying they’re introducing something new that stands on the side of religion, and when it comes to their attempt to explain what they are trying to explain, the physical universe for the most part — it really does put aside religious concepts and replace them with observation and reason as the way to do things. So, what we are seeing of course in Miletus is the birth of philosophy at the same time as we are seeing the birth of natural science, and these do not get separated until many, many, many years later on; they are together. That’s the city where the rebellion starts. It has nothing to do with philosophers; it has to do with the tyrant of Miletus, a Milesian by the name of Aristagoras, who gets into trouble with the great king. He has talked the great king into an expedition that he wanted to launch against the island of Naxos in the Aegean Sea. He says Naxos is a cinch; it’s a nice fat place. They’re not ready, and if we sail now secretly, I’ll be able to quickly take the island, and the great king will have another expansion of his empire, and of course Aristagoras would benefit both financially, and also by the presumed honor that he would gain from the great king. Unfortunately, the security procedures were inadequate and what he was up to got to Naxos before he did and the Naxians were ready. He was defeated, and the great king was not pleased. Aristagoras knew he was in a lot of trouble and so he decided that this was the time for the Greeks of Asia Minor to acquire their freedom from the Persians, and he was obviously a very persuasive talker and went around to the various Greek cities and was able to persuade most of them to join in the rebellion, which is indicative, of course, of the fact that they were not happy in their position as subjects of the great king. So, they rebel against the tyrants who have been collaborating with the great king and this is an interesting point. They establish democracies. Now, as far as we know there is no democracy in the world, and there never has been before the one established in Athens just a few years ago. I think there’s a lot of reason to think that the idea of doing that came from Athens, and that is easily believable when you realize that Athens, as I’ve told you before, is an Ionian city just as these cities, Miletus, and the other towns that they get to join them at first, are Ionian cities, and the Athenians are recognized by the other Ionians as the leading Ionian city. So all of that makes me think that it’s hard to avoid the conclusion that it’s Athenian democracy that is the model for these rebellious Ionian states. Cleomenes says, “Stranger get out of town by dark.” The idea of suggesting to the Spartans that they should launch an expedition across a sea, which will then take their army three months to march away from the coast, not to mention from Sparta, leaving the city, of course, open to a helot rebellion all the time they’re gone, that is not a very welcome suggestion. 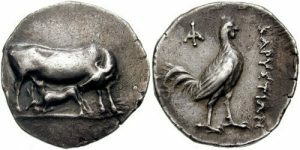 So, Aristagoras says, well, you know it’s not really so bad; they got this good road, besides I have here some several minae of silver that I’m glad to give to you, you might want to think again; and he keeps raising the amount that he’s prepared to bribe Cleomenes. At a certain point, Cleomenes’ little daughter, Gorgo, has been sitting there all the time, and being a Spartan girl, she gets up to her father and says, father ask this man to leave at once or he will corrupt you. 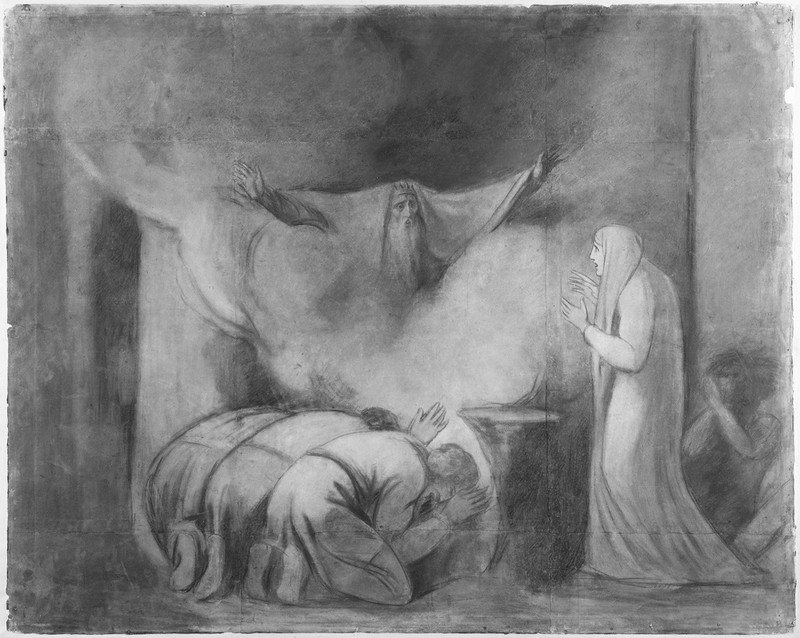 Cleomenes accepted the admonition from his nine year old daughter and sent Aristagoras away. So, the effort to gain Spartan support in this rebellion failed. Well, Aristagoras says, okay I’ll try Athens; now, Athens of course he’s got a much better shot. The first place Athens is an Ionian city, unlike the Dorian Spartans; second place Athens sits on the seashore closer to Persia, right on the Aegean Sea, and obviously can feel that there is a certain danger that might be coming from Persia in any case, just because the Persians keep expanding and they’re now sitting right on the Aegean Sea. So, for these reasons, and perhaps others, maybe they were already — I was going to suggest — maybe they were already involved with Aristagoras and the rebels of the Greek cities of Asia Minor, because of the democracy idea. That gives me the suggestion that there’s been some communication. Anyway, whether that’s true or not, the Athenians vote to send a fleet and soldiers to assist Miletus and the other cities in their rebellion and they send — well, I’ll come back to what they send in a moment. Herodotus decides it’s time to make a point; he says, this shows how much easier it is to deceive many people, rather than one, because by this count it has got to be wrong; there were 30,000 Athenians who were involved in this decision. That’s certainly far too many, and they were fooled by Aristagoras, whereas, King Cleomenes, the one man was not. However that may be, what the Athenians voted was to send twenty ships. Now, some scholars would have said, only 20 ships. The “only” is really, I think, a mistake. 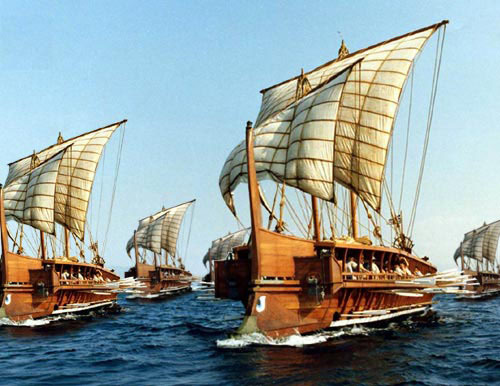 They are led to that by knowing that later in the fifth century the Athenians will end up having 400 triremes, but that’s many years later, that’s after a victory over the Persians. That’s in a totally new world. Best guess I would have now is that all the ships the Athenians had were maybe fifty. So, sending twenty was not a trivial contribution. Why did they do it? Well, for all the reasons I’ve suggested, they care about the Ionians. They are their relatives in their own mind. Moreover, they are not very friendly to Persia after the exchanges they have had with the great king in which it’s clear the only way to deal with the great king is to become his subject, something they’re not eager to do. Another thing that we need to take into account is that the Athenians, remember at least back to the time of Solon and possibly before, have been increasingly engaged in trade with the east, that is to say, with Asia Minor, with the Hellespont, Sea of Marmara, the Bosporus, beyond that into the Black Sea; in other words, into territory bordering on the Persians so that they have to feel that if the Persians are unfriendly or if the Persians just do what comes naturally to them, they soon may be interfering with things that we need, we increasingly need. The Athenians will be increasingly dependent on grain and fish from those waters. So, all of that can explain why the Athenians are willing to take this enormously risky decision when the Spartans, of course, wouldn’t think of doing it. Herodotus has this wonderful phrase to describe the Athenian decision. These ships were the beginning of evils to the Greeks and the barbarians. I guess what he’s really saying is, here we have the beginning of the Persian Wars, my subject. The Ionian rebellion is one thing, theoretically, if the Athenians had minded their own business and not assisted the rebels, then there need not have been a Persian War. Heaven knows what would have come next. But in any case, I think Herodotus is saying once the Athenians decided to participate, assist the rebellion of their relatives in Ionia, this was the beginning of the Persian Wars for Athens. Well, the twenty Athenian ships land in Miletus and their soldiers march inland very swiftly, and reach the city of Sardis, which is the capital of the Satrap of Lydia, which now a Persian province, and are successful in defeating the forces that come out against them and set fire to the city of Sardis. So, they’ve done real harm. Having done that the Athenians — forgive me, I left out a small but important point. The Athenians were joined by a few ships provided by the city of Eretria, another town in northern Euboea, an old time rival and enemy of — what’s that other town up there? Chalcis. 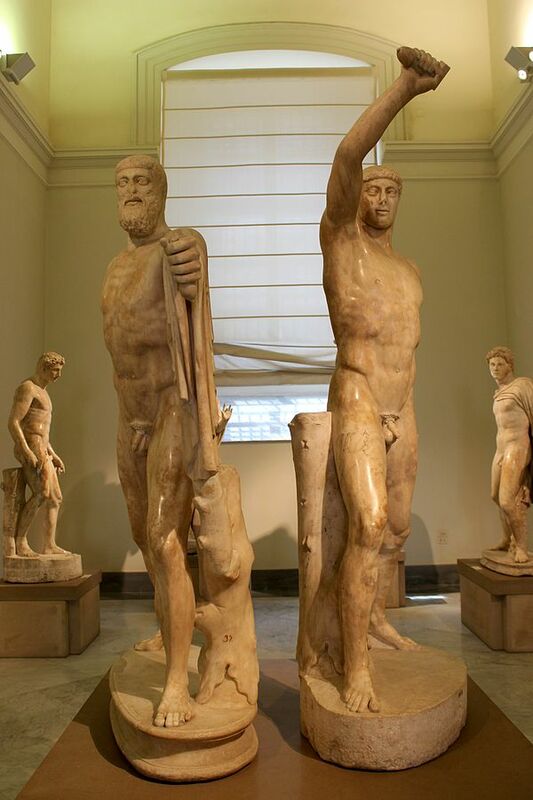 They’re old enemies of Chalcis and that may account for why they are eager to help the Athenians, because the Athenians have defeated Chalcis and are keeping the Chalcideans down; in any case they do. A few Eretrians, twenty ships of Athenians accomplish this deed of doing considerable harm to the great king’s position there in Lydia. Well now, the Persians launch a thorough going expedition, with the intention of subduing their Ionian subjects and bringing them back to subjugation. Well, it’s not all that easy. This rebellion takes place in 499; the war against Persia doesn’t end until 494. What the Persians are doing is laying siege to the cities one by one, and taking them one by one, and then attacking from the sea and that was critical. If they could defeat the fleets of the Greek cities having already surrounded them on the land side, those cities were out of business and would have to surrender. 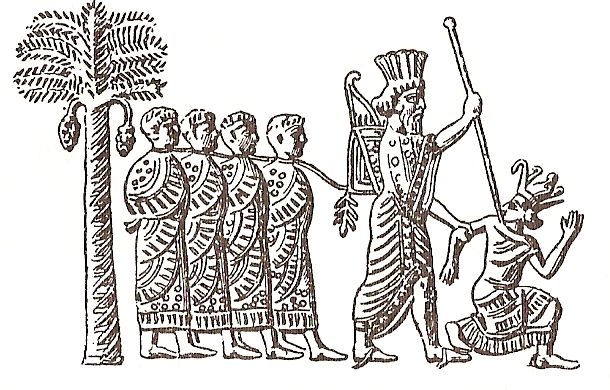 In 494, the fleet that the Persians gathered — the Persians of course were land lovers; they had no navy of their own, but they had a very considerable navy provided by the Phoenicians, who were among the earliest of the sailors of the eastern Mediterranean, whom the Persians had conquered and the Egyptians who had a naval tradition as well. So, there was a big Egyptian contingent, a big Phoenician contingent, and when they were under Persian rule, the Ionians provided ships for the great king too. They weren’t available right now; they were going to be fighting against the great king, but that’s where he got his forces from. They were numerically superior and they were very good sailors and horsemen. So, finally at the Battle of Lade, off the coast — that is on the coast of Asia Minor near Miletus, the Persians destroyed the fleet of the Greeks and put down the rebellion. Then they took vengeance for the whole thing by laying waste the city of Miletus entirely, burning it to the ground as best one could do that in those days. So, the Ionian rebellion has come to an inglorious conclusion. What next? What next is determined in considerable part by the internal affairs of the city of Athens. The Athenians are going to be the most troubled by what has happened, and also they have a reason to be troubled. The great king like — this is true of most any great empire, or any great power that has been attacked or even insulted by some smaller state, you just can’t let that go by, you must punish that action to deter similar behavior in the future. So, the Athenians had every reason to fear an invasion or some sort of attack from the Persians in the future. I think that is critical for understanding what’s going on in Athens in these years. We do have a few glimpses, just a few glimpses that are difficult to interpret, but may possibly make a certain amount of sense. It is interesting, I think, that in the year 496-5, which is to say before the battle of Lade, while the rebellion is still on, the man who is elected the eponymous archon for that year is Hipparchus, the son of Karmas, a relative of the Peisistratids, and he is precisely the man, who tradition says the first ostracism was allegedly aimed at. What is going on here? Why is the Peisistratids Hipparchus being elected at this point, when in fact, we know that the Persians have said that they wish to put his relative Hippeis back on the throne? Why would the Athenians elect this guy? Well, the only interpretation that makes any sense to me, is that you remember that fairy tale I told you last time about the law on ostracism, and about how I imagined Cleisthenes telling Hipparchus that he could avoid a lot of trouble, if he would join up with Cleisthenes. I think he did, and I think his election to the Archonship demonstrates that. It’s still Cleisthenes regime that is in power. If Hipparchus gets elected archon, it must be because he’s on board. All of this is hypothesis, but it seems to me to make sense. The next event that we hear about in Athens that’s relevant to our story is that in the year 493, the Athenian tragedian Phrynicus presents his play called, The Capture of Miletus. We don’t have the play but we have stories about it, including one in Herodotus, and what the stories say is that the play showed the scene of the taking of Miletus and the destruction of the city by the Persians, and that the play was so moving the Athenians were made so unhappy by seeing this story that they took measures against the playwright for making them so miserable, and fined him heavily for doing so. What’s that all about? Well, there are various possible interpretations, but I think the one that’s most persuasive to me is that Phrynicus knew perfectly well that when he put on this play that it would cause great unhappiness in Athens, and great anger. I think he hoped it would raise, anger against the Persians, and it would support the idea of the Athenians preparing for war against the Persians, either in the likelihood that the Persians would invade, or that the Athenians would have to do something aggressively against Persia somehow. That’s, I think, that’s the interpretation that strikes me as being more plausible than other possibilities, but again, it’s only a hypothesis. In the same year, Miltiades comes back to Athens, having traveled from his home in the Gallipoli peninsula and he is — think of it for a moment. What’s his position going to be vis-à-vis Persia? It has to be anti-Persia, because he has betrayed the king of Persia; he’s obviously got a price on his head. 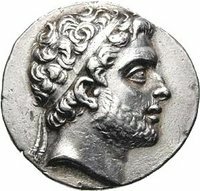 If the Persians succeed in putting Hippeis on the throne, and making Persia boss of Athens, his life isn’t worth a nickel. So, he’s got to be anti-Persian and I think what happens next has to be understood in terms of the political struggle in Athens in which — by no means were all Athenians convinced that it would be a good thing to war against Persia. I mean it’s crazy. What I want to communicate to you is the idea of fighting against Persia now is insane. The Persians have conquered most of the known world as far as the Greeks are concerned. They have just bashed their fellow Greeks without a lot of trouble in Asia Minor. Why would you want to take these fellows on? What you would want is to avoid conflict with them to try to find some means of coming to terms with the Persians. I’m sure there must have been Athenians, and Herodotus says there were, who would have preferred accepting Hippeis back as tyrant and having the Persians be the real rulers of their land, rather than all getting killed, when the Persians decided to come after them. So, you’ve got these two factions; one pro-Persian, one anti-Persian, and the fact is, apart from hypothesis, that Miltiades is brought to trial in Athens. The official charge against him is of having been a tyrant in the Gallipoli peninsula, when he was in charge of it there, and he is in fact acquitted of the charge, which may suggest, if the jury was influenced by popular opinion and had a political view, that the majority of Athenians were not willing to take the tyranny back in any circumstances and were prepared to fight. Now that — interpretation again is hypothesis. The fact of the trial and the acquittal are there. Another interesting event is that in the 493-2 — that was one big year, that year 493. Themistocles is elected the archon, the eponymous archon for the year, and we shall see that Themistocles will play a very large role in the great Persian invasion of 480, and he will be a participant in the Battle of Marathon too, and Themistocles is a great champion of the navy. He has concluded for varieties of reasons, that Athens must have a much larger navy than she already has, and he also is obviously a member of that faction that thinks the Persians will be coming and that wishes to be ready, and is eager to fight against the Persians. So, Themistocles is on the scene and one of the things he does that looks forward to the rest of his career, is that he wants to move the naval base of Athens from Phaleron bay, which is just a beach, unfortified, completely open to attack if anybody comes. So, the Athenian fleet, presumably, would be drawn up on the sands of the beach at Phaleron, where you can go swimming to this very day, and if those ships are up there on the sands, a Persian fleet comes sailing up they’re stuck. What he wants to do is what he begins to do, to make Piraeus, about five miles up the road into the port of Athens, the naval base of Athens, It has three of its own harbors readily protected. 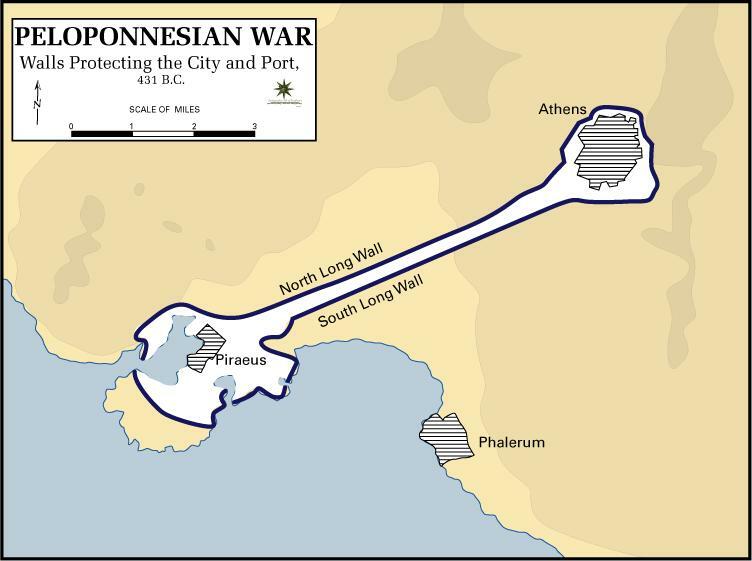 If you build walls around them, if you fortify the Piraeus, then you have a port that will be secure against an attack, and also be a very good base for moving out of. So, Themistocles demonstrates what will be his policy for the rest of his life in regard to Athens and the fact that he’s chosen Archon may be indicative of the mood in Athens, which is increasingly unwilling to accept the idea of a return of Hippeis and of Persian rule, and is ready to fight about it. Well, by now the King of Persia has decided that he must avenge all that has happened and he must go after the people who have done him harm, Athens number one the little town of Eretria, number two. He takes a great Persian fleet, accompanied by a great Persian army, and starts marching along the Aegean coast, first the east coast and then crosses the Hellespont and goes over onto the northern coast. He himself is not doing it, his General Mardonius is in charge. He conquers the regions of Thrace and Macedon on the north short of the Aegean Sea. But in 492, while his fleet is lying off the peninsula that contains Mount Athos, one of those terrible Aegean storms that can come up very suddenly, does indeed come up very suddenly, and pretty well wrecks the Persian fleet. So serious is the damage that the Persians have to abandon their invasion of Greece, heading for Athens at this time. 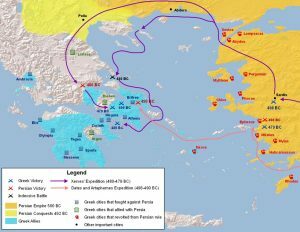 This, I should point out, is precisely the route the Persians will take for their major invasion in 480, but for the time being, that has been put off thanks to the intervention of the storm, or as the Greeks might put it, of the gods. Now, as the Persians have actually begun to make their invasion, the Greek cities are aware the Persians are coming, the Persians are coming. The question is what to do? Well the Island of Aegina, which is unfriendly to Athens, you remember from way back. They decide we’re not going to be swept away with the Athenians when the Persians get here, and they give earth and water to the king. They have in fact become Persian subjects. At this point, Cleomenes changes his mind; he does not want to sit there quietly while the Persians come and invade Greece, and so he now goes to the island of Aegina, takes hostages, delivers the hostages to the Athenians, and in so doing creates a rapprochement, between Sparta and Athens. And now the Spartans and the Athenians are allies. 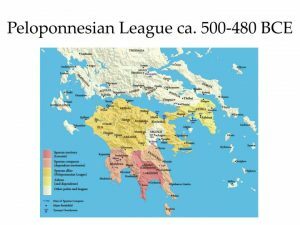 That doesn’t mean that the Athenians have joined the Peloponnesian League; they just established friendly relations after being at odds for such a period of time. There is a quarrel between the two kings, as I’ve told you, and it’s at this time that Demaratus is sent into exile and Cleomenes himself comes out very badly. So, both kings will be in some degree of disgrace at the time of the battle of Marathon. Well, let us turn then to the Persian invasion that culminates in the battle of Marathon. The purpose is very simple, to punish those cities that have insulted and damaged the great king, Athens and Eretria, to restore Hippeis to the tyranny in Athens from where he can serve as the king’s satrap, and surely also, to gain a foothold in Greece on the way to conquering all of Greece. Why should he want to conquer all of Greece? Herodotus tells the story about his relative, he tells him, for God’s sake why do you want to go Greece? There’s nothing there but a lot rocks. What is the point of conquering the place? It’s one thing to conquer all of these rich places Egypt, Babylonia — that’s fine, there’s wealth there, there’s huge populations, there’s a lot of good stuff. It’s just Greeks and rocks, why in the world do you want to go there? The answer, I think in part, would be Sir Edmund Hilary’s answer, because they’re there, and that’s part of the answer, because we must understand that the ancient idea — in fact, I’m willing to say, the idea that dominated thinking about such matters right down probably into the nineteenth century in many cases, but certainly before the advent of Christianity was this. That conquest is good. It’s good to be strong, it’s good to be rich, it’s good to be powerful. Therefore, it’s good to be stronger, richer, and more powerful. If there’s somebody on your frontier, take them over, and that by the way will make you still more glorious, because conquest is glory. Now, we in the west — that’s not our natural attitude; our natural attitude is shaped in considerable part, whatever your religious association may be, by Christianity, which has been the dominant force in shaping people’s thinking in the west, as I say, whatever religion you belong to, and that aspect of Christianity that it violates is the one that’s increasingly the one that’s emphasized by Christians, and that is the Sermon on the Mount. The one that says the meek shall inherit the earth, not the strong, and the tough, and so on. The one that says if your enemy strikes you, turn the other cheek so he can strike you there too. Now, if the Greeks had heard that, they would have said these people are lunatics. Send them away. Greek morality said, be good to your friend, do good to your friend and harm to your enemies and the second part is just as important as the first part. So, you need to understand that the sort of the ethical underpinnings to all of our natural thinking in the west are as odd and strange, and crazy as they can be for everybody else in the human race, so far as I can see. There are exceptions. I am missing some eastern religions which have ideas that are not altogether in anathema to what I am saying, but what I’m trying to say is nobody in the ancient would have ever had such an idea. Of course, if you can conquer somebody who’s your neighbor, you do and so there was every reason to know that the Persians were coming. How many? We don’t know. The estimate that most people would accept is somewhere between 20,000 and 30,000 infantrymen. So, for the sake of splitting the difference I always assume something like 25,000 infantrymen, and some cavalry. That’s very important even though the cavalry does not play any part in the actual battle of Marathon, but Herodotus makes it very clear that there was a Persian cavalry, that the Persians picked the site of Marathon to fight in, in part, because it was a good place for cavalry to fight. So, there is Persian cavalry on board the ships anyway, alongside the infantry. The two Persian generals are Datis and Artaphernes. They have with them Hippeis. Hippeis, of course, must have been all these years urging the great king to make some such campaign, and he probably would have said, Marathon is the place to land. You remember that’s the territory of the Peisistratids, that’s where Peisistratus landed on his last return to Athens when he made himself tyrant, that’s where his people were; that’s where his forces would gather. I’m sure Hippeis said what all such exiles always say. All I need do is set foot on the beach at Marathon, and my people will rise up as one and join me. You won’t even have to fight in Athens, because they’ll be so glad to see me back. This is what King James, I’m sure, told Louis the XIV about getting back to England. One hears that all the time, but it’s a very important part of this story. I don’t think we can understand what happens at Marathon, if we don’t know that everybody thought it was highly possible that there were Athenians, who were eager to restore Hippeis to the throne, and would be willing to engage in treasonous activities, or to defect from the democracy, and join Hippeis, if the circumstances were appropriate. So, that’s in the back of everybody’s mind or in the front. I think when the Persians got there, their strategy included the belief that there would be treason in Athens that would turn the city over to them if the circumstances were right. So, that force starts this time, not along the coast, as I told you last time. It takes the shortest route, directly across the Aegean Sea, hopping from island to island. 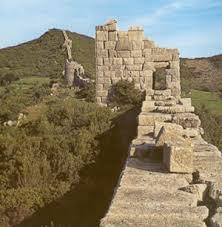 Stops at Naxos, remember Naxos annoyed the king by successfully resisting Aristagoras’ invasion and they destroy Naxos. 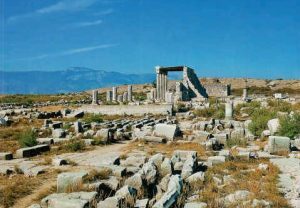 Next they come to the island of Delos in the middle of the Aegean, the islands sacred to Apollo and his sister Artemis, a very sacred place indeed for the Greeks. What do the Persians do? They treat the Delians and the priests of Apollo at Delos with great respect, do them no harm; this is typical Persian conquests. They do not impose religions. Their religion is different from that of most of the others in this area. They are Zoroastrians; they are sun worshippers of a certain kind, but they don’t impose their religion. They don’t interfere with the religion. They get a very nice write up in the Old Testament, if you remember, because they don’t mistreat the Hebrews, and they particularly don’t compel them to abandon their own religious practices as the other invaders do. So, what are the Persians saying by these actions? They are saying we are not at war with the Greek gods, we’re not even at war with the Greeks, we are simply punishing these two miscreant towns that have attacked us. They then turn to the southern tip of the island of Euboea, to the town of Carystus; the Persians may be not at war with the Greeks but they expect all Greeks who are along the way to behave the way they’re supposed too to the great king, and so they asked the Carystians to give earth and water, the Carystians refuse and the Persians obliterate their city, and take their people into slavery. Now, they push their way, take their sail along the coast of Euboea to Eretria in the north, and now here are 4,000 Athenians settled there, you remember in a cleruchy. So, they get their armor on and they stand in front and prepare to die fighting for the freedom of Eretria, because of their wonderful friendship to Athens. Wrong. The 4,000 Athenians go home to Attica. Why? Well, I suppose the immediate answer is why not. But it’s an embarrassment, and Herodotus, I think we have to realize, is very friendly to Athens all throughout his own history. I mean, there’s no doubt that he spent time in Athens; he seems to have been a friend of Pericles in later years. 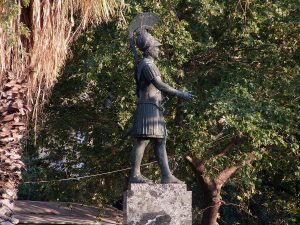 He was kindly, although he himself comes from Halicarnassus in Asia Minor, but he did spend a lot of time in Athens and there seems to be a pro-Athenian cast. One thing also, is that many of his sources were Athenians, who told the story their way. So, their answer was the Athenians were ready to fight to save Eretria but the Eretrians said there’s no point. Why should you get killed too; it’s not your town. Why don’t you go home. If you can believe that, you can believe anything, but I don’t. I think the Athenians realized there was nothing but disaster, if they stayed, and they could believe if we get back to Attica, we might be able to make a contribution to defending our city. Okay, so now here they are at Eretria, the Athenians are gone; it’s time for the invasion. The site of the battle, where did they go? Well, they picked Marathon, as they say in part, because it’s very near Eretria. Secondly, as Herodotus says, because it’s a good place for cavalry; thirdly, as I’ve already told you, because it’s the stronghold of Peisistratus, the place which would be natural for an army trying to establish Hippeis on the throne of Athens; that’s why they’re there. Their plan, I think, is to go to Marathon. If the Athenians come out and challenge them to a fight, they will crush the Athenians. But they didn’t expect that. They thought the Athenians would be afraid, and that what would happen is they would stay there in Marathon, until they got the news that there was a revolution in Athens prepared to turn the city over to them. That’s what Hippeis, I think, led them to believe, and that’s what they hoped for. They were prepared to fight, of course, but they thought it wouldn’t be necessary. So, on August 4th, they land in the year 490 at Marathon. We know these dates, because there is an eclipse associated with this, which allows astronomers to fix it pretty precisely. The Athenians, of course, when they knew that the Persians were coming and that news would have come to them the minute they got to Naxos. Ships would have come to Athens, so the Athenians were well warned; they went to their new friends Sparta to ask them for help of course. This is where there are wonderful stories; they sent the great runner whose name comes down to us in the manuscripts as Pheidippides, chances are his real name was probably Philippides, but there was an error in the manuscript. But we’ll call him Pheidippides, because that’s what the manuscripts say. He races to Sparta as fast as he could go; it took him less than two days, where he came to the Spartans and he said, the Persians are coming, the Persians are coming, please help us. The Spartans said we would love to come and help you, nothing would please us more, unfortunately, we are in the midst of our holy religious ceremony the Carnea, and we are not allowed to leave our hometown until the next full moon, which is a matter of fact, the night of August 11th, 12th, in other words, a whole week after the Persians are going to land. I can’t go speculating as to what are we to make of this. Is this just an excuse? Are the Spartans serious about this? Our tendency I suppose, being modern and cynical, would be to say it’s only an excuse. I’m more inclined to think that they were sincere about it. It’s not that they couldn’t find ways to get round such things, but they really took their religion quite seriously, and it may be that that did play a role. Be that as it may, two things that the Athenians now know. They know the Spartans have promised to come but not for another week. Both of those things should be on your minds as you try to understand. Now, Herodotus says that the Athenian army marched out from Athens and went to Marathon, and then they had an argument about what they should do, but I don’t think that’s right. There must have been a debate. There had to be a debate in Athens. You couldn’t take an army out of town without having an assembly to argue the question, should we send an army, and if we should send an army how big should the army be, and having decided that, who should be in command. All those things had to be settled by the assembly in Athens; so, that is where the debate took place. Some favored defending the city of Athens. 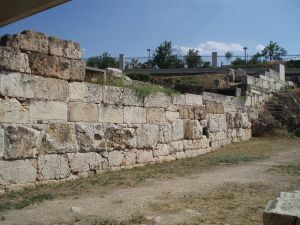 Now, we don’t know how well the city of Athens was walled, defended by fortification at this time in its history. It may not have had any walls, but I would be surprised. But it certainly did not have a wall that was guaranteed to be effective against an attack, and so I think we should understand that is not going to be successful. To stay home and defend Athens means to allow the Persians to run all around Attica doing anything they want, causing all the harm they could, remember something over seventy five percent, maybe as many as ninety percent of the Athenians had farms out in the country, had houses out in the country that would have been exposed to the Persians and so there was good reason for them not to think that was a great idea. The alternative was to send an army out to allow the Persians to land, because they couldn’t stop it; they didn’t know where the Persians were going to come, but as they heard that the Persians had landed, just send an army there and meet them at the place of landing. Miltiades emerges as the leading figure here. I mean, he is a general, but that’s not the only reason; it’s because everybody knows Miltiades is the resident Persian expert. He has been a general in the Persian army, and so that gives him a reason to be listened to, but he’s obviously also a person of great merit and quality, and proves it at the Battle of Marathon. He must have been an impressive fellow. So, for all these reasons whatever his formal position was, and I think it was simply one of the generals, de facto he had much more influence than others for these reasons, and his argument was let us go out and meet the Persians where they land. 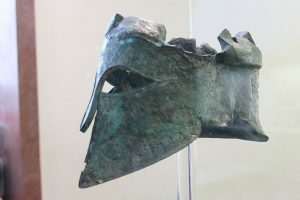 Other reasons were we don’t want them to be able to get to the Spartans, but beyond that, there was fear that if we stay home and wait, and let the Persians do whatever they’re going to do, every day that passes, it increases the danger of treason from those people who want to turn the city over. It’s also so completely against the ethic of the Greek warrior, and I would say more specifically, the hoplite warrior. You don’t let your enemy ravage your countryside. You don’t let them destroy your farms. This in a way goes all the way back to Homer, the notion of arête, a man must have courage, you must stand up against an enemy who invades his country, and then again, beyond that you move to the world of the hoplite and you’re talking about defending your homestead; all of that argued for going out there. So, the modern terminology I would use to explain what the Athenian strategy was to go out and to contain the beachhead, go out confront the Persians where they are, don’t let them get inland from where they land. So, they do land at Marathon with about 25,000 infantry. Now remember, their infantry are not hoplites. They do not have heavy armor. There are vases that showed the Persian soldiers at Marathon, and they are wearing pants, as I told you, but they’re not wearing any armor. Their shield is a kind of wicker shield, so that their armament is much inferior to the hoplites, and keep in mind too, that the Persian army has always been made up of a collection of subject peoples. Yes there will be some Persians, but there will also be lots of folks who are not Persians in there. So, they lack that unity that the Greeks will have. Miltiades’ plan is this, there are something like 10,000 Greeks, about 9,000 Athenians, about 1,000 Eretrians against let us say 25,000 Persians, and so as the thing begins the map here shows you the rough picture of the field at Marathon. Here the Persians landed right here and had their ships drawn up at this place. They had their camp behind here. This marsh ought to be a little more over this way; it’s a very serious marsh. It’ll play an important role in what happens. The Greeks come out — they probably came marching in through this way and here we have mountains. This wavy line indicates the line of the mountains. Here you have a really flat plain, but here you have mountains, and somewhere up on the hills here there was the Greek camp near the modern church of St. Demetrius. This little dot reflects the mound where the dead, the Greek dead at Marathon will after the battle be buried, and that is likely to be about the place where the main fighting took place, which helps us to place where the actual battle took place, so the idea of the Athenians was to try to hold them there as long as they could. The Greeks have the upper hill, the Persians are down below. If the Persians want to start a fight, then they will have to come running up the hill. Well, that is not a very attractive proposition and so the Greeks feel, let them come for us. It’s our country. So, they’re sitting here. They’ve got to do something; we don’t. Meanwhile, the Persians are waiting for treason, so that the city will be surrendered to them. A week goes by with the two sides looking at each other and doing nothing. I always like to compare the Athenian strategy to an old fashioned football strategy, which I haven’t seen done now in decades, which used to be kick on first down and wait for a fumble. In other words, give the ball to the Persians and let them make a mistake. I think that’s what was in Miltiades mind. Well finally, time passes, and the Persians realize we can’t sit here forever. For one thing they’re going to run out of food and water, for another thing, the great king will want to hear something. Well, how did you do? What did you do? We sat there and watched the Athenians; no good. So, the plan that the Persians made, I think was this, that they would take — let us say for the sake of argument, 10,000 troops, put them on the ships, load up the cavalry onto the ships too and send those ships around Attica to come up to Phaleron Bay straight into Athens, and meanwhile take the 15,000 that are left, march them up as close as you could get to the Greeks and fix the Greeks there, so that they can’t go back and defend Athens. So, there’s no army to protect Athens. So if those guys get off the ships, come sailing into the harbor, walk up to town, it’s theirs. If the Athenians are crazy enough, from the Persian point of view, to come running down the hill or walking down the hill or whatever to be outnumbered three to two by us — and anyway we’re Persians we always beat Greeks, we’ve got nothing to worry about, then let them do it. So they come. Now, Miltiades is in charge on the day of the battle. He’s got the problem that they have 5,000 more troops than he has. He’s worried about being outflanked. So, what he decides to do is to weaken the depth of his line because he must cover the length of the Persian line. Well, the danger with that is, of course, that when they hit each other the Persians will break through the Greek line. So, instead of making it even, he loaded up the wings and left the center even weaker than it would otherwise have been. His hope and strategy was that the Athenians would win on the wings before the Persians could break through the middle and then the Athenians could turn on the center of the Persians and defeat them, and just barely that’s what happened. The Persians did break through the center but they were too late. By that time the Greek wing, the Athenian wings were successful and drove the Persians before them, the Persians ran away like mad, but they ran into the great swamp and that made their escape much more difficult. So, the Athenians were able to kill great numbers of them, and finally that battle was over. Now, the battle was over, let’s imagine that it took a couple of hours that would be a long time. The Athenians had time now to have a meal, take a little rest, and march back across to Attica before the ships could get there, and I like to imagine the scene when it all happened. The Persians coming around the last bend of the bay as they come into Phaleron, expecting to see a nice empty beach and seeing the Athenian army. I like to imagine with their left foot in the breakers, and their shields and spears up with the sun gleaming off their shields and blinding the Persians as they came. At which point, you can’t force a landing against an army; it just can’t be done in the ancient world. These guys had to go home and start thinking about what they’re going to tell the great king. The Athenians won the battle, very large casualties for the Persians. Only 192 Greeks killed in the battle and allowed the extraordinary honor of being buried on the field where they fought. Next day 2,000 Spartans come marching into Attica; that proves they were serious and were told what had happened. They asked permission — can we go to the battlefield and look at it, and there they saw all these dead Persians and no one had ever seen anything like that. No Greeks had ever beat Persians before, and great was the glory of the Athenians. So I’ve described very inadequately and too swiftly the battle. So what? What is the significance of this silly little battle 10,000 Greeks against 15,000 Persians back a billion years ago, what does it matter? Lots of folks will tell you that, especially these days. But I remember in 1936 there was a wonderful conference of pacifists, who met in England, at which the dominant theme of the speakers was, no war ever made any difference. What I like about that was that the place of the meeting was Hastings. The battle was seen throughout the rest of Greek history, first of all, as a great victory for hoplites as opposed to their opponents. In later Greek history, when the navy becomes a big thing, it is the party, the old fashioned and more conservative party that thinks about Marathon as the great victory, the day that those hoplite farmers saved Greece. The navy guys, the poor like to think about Salamis, the naval battle in 480. It was seen as a victory for democracy; it was the Athenian democrats. Later on I’m sure they were glad the Spartans never got there, because they could claim it as their own, and as a victory for democracy as well. It was also the first, as I say, Greek defeat of the Persians. As Herodotus says, for up until then even the name Persians was a fearful thing for Greeks to hear. 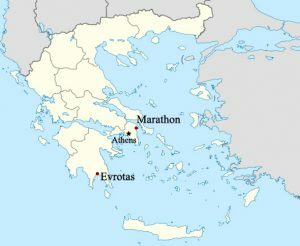 It was a source of tremendous national pride and glory for Athens, and scholars have compared the impact of the Battle of Marathon on the Athenian image of themselves with the defeat of the Spanish Armada by Elizabeth’s English fleet and the beginning of the glory of the Elizabethan Era. It was seen as a victory for freedom, because the price of defeat would have been slavery in every sense, as they understood it. Greek civilization, and I’ll come back to this in a minute, could have been strangled in its infancy, because it is in its infancy. But again, we ought to pay attention to those people who suggest that people like me are over-embellishing the significance of all this. One English statesman said war wins nothing, cures nothing, settles nothing; the speaker was Neville Chamberlain. In 1936 Bertrand Russell would declare, disarmament and complete pacifism is indisputably the wisest policy, and he urged the gradual disbanding of the British Army, Navy and Air Force, as Hitler was moving into the Rhineland. Does victory in war make a difference? I would say ask the losers, the victims, and the survivors of the Holocaust. Ask the descendants of the slaves in the American south. Remember this, if the Athenians had lost at Marathon — Aeschylus had just begun his career as a playwright, Sophocles hadn’t written a play, Euripides of course hadn’t either, nor had Aristophanes. Socrates, if I got this right — Socrates wasn’t born yet, much less Plato, Aristotle, Phidius. There was no Parthenon, none of those glorious buildings that make us think about the greatness that was Greece had been constructed. There would be no democracy, because this was the only place where it had any existence. The scientific revolution which was beyond its infancy in terms of being new would have been wiped out. There would be no memory; there would be no record of any of this. Therefore, no Western civilization, no political freedom, for all these have occurred in no other culture in all the years since that time. That’s why I wanted you to know a little bit about the battle of Marathon because I think all of us alive today here owe a very great debt to the 10,000 marathonomachoi, the fighters of Marathon who fought for Greek freedom and for ours too. The Persians were busy with other things as well as thinking about returning to Greece because the great king was not willing, and understandably in a way, to accept his defeat by these few puny Greeks, because of the consequences that would have for the reputation of Persia, and just as a matter of personal honor these kings would not have been glad to accept such an outcome. I won’t drag you through the details of the invasion by the Persians in 480. After all, we’re making you read Herodotus, and the whole problem about it. But let me simply talk a bit about the conclusion to the great invasion, the great Persian Wars, as we call them, and also to say something about what their meaning was. The meaning of the defeat of the Persians in 479 was broader than the meaning of their defeat at Marathon in 490. For one thing, it involved the entire Greek nation; of course, it wasn’t a nation, but you know I’m using the word loosely. Of course it didn’t involve the whole of that nation no matter how loosely I use it, because if you imagine that there are over 1,000 poleis, there were only 31 who signed up to resist the Persian invasion of 480. However, they included the most important, and strongest, and largest of the Greek poleis. So, it’s not too much of a stretch to speak of it as a Greek victory. Again, the same issue that had been present at Marathon, the question of whether the Greeks would continue to live their lives free in their poleis, developing their own style, their unique style of life or become another province of the Persian Empire just like so many others. We can see that in one wonderful contemporary reference to the meaning of the war — it’s in Aeschylus’ oldest surviving play Persians, in which the central event is the great sea battle at Salamis in which the Greeks defeat the Persian fleet, which guarantees that the Persians will not win a great victory, even though two more decisive battles in the following year 479 are necessary to drive the Persians away. But here’s what Aeschylus describes in his play Persians. He’s having the story told by — I’m trying to remember, it may well have been a Persian who’s telling the story, but in any case — probably not. It was one of the Greeks. Anyway, here’s what he says, “a mighty shout greeted our ears, on you sons of Hellas, free your homeland, free your children, your wives, the homes of your father’s gods, and the tombs of your ancestors.” In other words, this play was put on something like — about I think it’s about seven years after the Battle of Salamis. So, it’s almost a contemporary event and you can see that from the first the Greeks viewed this war as being about freedom as opposed to many other possible considerations. In the spring, in the following year in 479, there were two great battles that decided the outcome of the war finally. On the land, the battle of Plataea in southern Boeotia, in which a great Greek army, which included the major cities including especially Sparta and Athens took on a powerful Persian land army and defeated them on land. Herodotus says on the very same day — it would be a wonderful coincidence if it were true. It may be true. A sea battle was fought off the coast of Asia Minor at Mycale, where again, the Greek fleet once more destroyed the Persian fleet, and at that point the Persians had no choice but simply to flee and to try to escape the Greeks, who were pursuing them and doing their best to kill as many of them as they could. Now, after Mycale, a very important event took place that cast a long shadow about the future of what was going to happen in that part of the world. There was a conference held on the island of Samos, perhaps one of the most important of the Ionian islands off the coast, which brought to the Greek council that had been conducting the war, it brought the island states of Chios, Lesbos, and Samos, these are the three largest, most important islands that are located off the coast of Asia Minor. All of them had taken advantage of the presence of the Greek forces in that region to rebel against the Persians and now they wanted to be admitted to the league that the Greeks had formed in 481 to resist the Persian invasion. The Greeks referred to themselves to that league simply as the Hellenes, the Greeks, and it’s convenient to think about it as the Greek League meant to fight the Persians in that war. Now, this might seem like a simple thing to do. Why not accept these three Greek states, all of them potentially powerful and important, who want join the Greek League. One thing I think we need to understand once or we won’t comprehend the situation at all, we know that the Persian wars are over. We know that the Persians just ran away and weren’t going to come back and challenge this Greek victory for the longest time, but the Greeks didn’t know it. The Persian Empire was still intact; it was still an extraordinarily extensive, rich, and powerful empire. There was no reason why the Greeks should not believe that the Persians would be coming again, and if we don’t grasp that, then all of what they do now makes no sense. 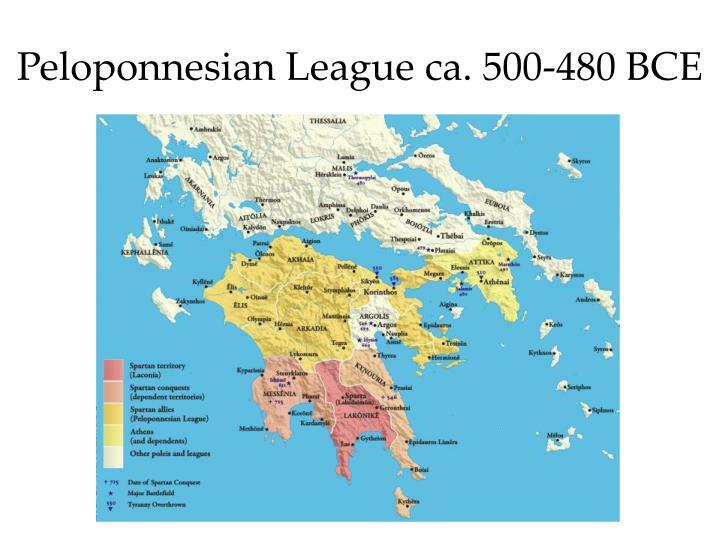 Well, Chios, Samos, and Lesbos wanted to be sure that they would be protected by this Greek League, if and when, the Persians came back and tried to put them back into the Persian Empire. So, there is a conference, but there is not a unity of intention. When the Greeks have to discuss, shall we take these people into our league, basically the Spartans said no, and the reasons for that are no so very strange. The Spartans certainly could conclude with security that there wasn’t very much danger that in the foreseeable future, the Persians would come marching into Greece again and present a threat to the Peloponnesus and to the Spartan predominance in that area, and we all know by now that the Spartans were most reluctant to be far from home anyway. They didn’t like to have to cross the sea to get to a battlefield and didn’t want their army out there on any permanent basis. Everything in their tradition said bring the army home, put an end to this activity, and they didn’t want to take on the responsibility of bringing these islanders into their league, so that they would have to go and fight for their freedom. On the other hand, the Athenians took the opposite view; they were very much in favor of bringing these states into this thing. Anyway, the Athenians thought differently and that’s not surprising either, because their situation was quite different from that of the Spartans. They were on the sea; they were accustomed to be at sea. Moreover, as we’ve seen and said several times, they had very important supply line, lines of communication and transportation, in order to feed themselves they needed to go out there and have freedom of the seas, and that meant that they had to see to it that the Persians were indeed driven from the Aegean Sea and the Hellespont and the straits in general, and the access to the Black Sea. So, for those reasons alone, the Athenians would have had to take seriously this request by the islanders. But it’s also true that at least some of the islanders, Samos particularly, were Ionians, as you remember, kinsmen of the Athenians. The Athenians were recognized as the leader of the Ionian people. So, there was that sentimental attachment as well. But most strikingly, I think we have to understand that the Athenians understood the Persians have to be kept away from the Aegean Sea and the Athenians also wanted very much, because ever since the rebellion of 499, the Athenians had wanted to liberate the Greeks of Asia Minor from the Persian rule. 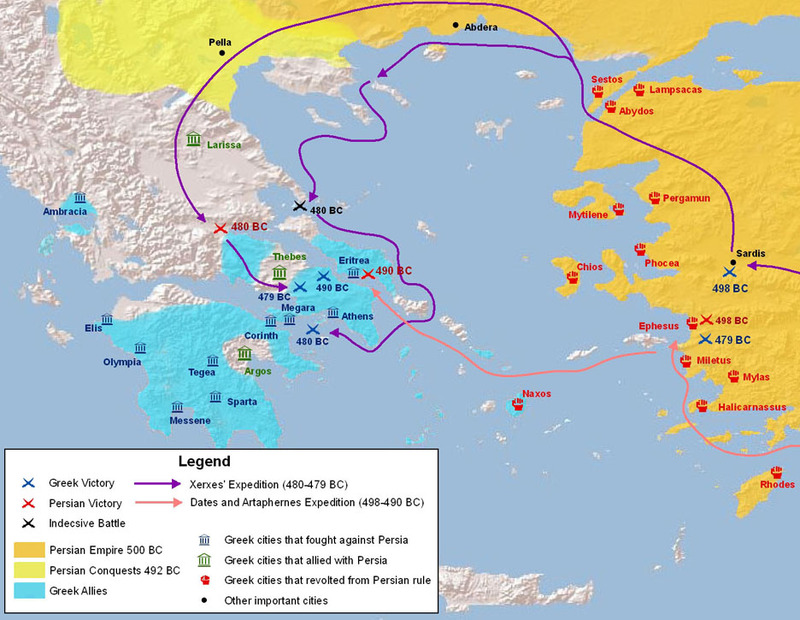 So, the Athenians won the argument; it was agreed to take these three island states into the Greek League and that meant that the Greeks would be committed to protect them should the Persians attack them again. In accordance with these decisions, the commander of the Spartan fleet out there, King Leotychidas sailed home and took his Spartans, and I would imagine his Peloponnesians with him. On the other hand, the commander of the Athenian fleet, Xanthippus stayed, and carried on the war against the Persians in the area. Let me just give you a small clue. Xanthippus will have a son — sorry he has a son in the year 479 whose name is Pericles, and we will be hearing of course a lot about him later on. The Persians have fled but there are a few places in Europe that, along the route of their escape, where the Persians still had control of a town or a city here and there, and one of the most important was the town of Sestos, located on the European side of the Dardanelles, and so Xanthippus besieged the city with the Athenian and the navy, and the rest of the Greeks ships that were still there, and after awhile, took the city by siege and cleared the Persians out of there. The result of the war was, of course, first of all, the vindication, the validation of Greek freedom. Greeks would indeed continue to be able to live the lives that they had been accustomed to. But another thing had happened, which was going to make an enormous impact on Greek life — you perhaps will remember that before the Persian invasion, but not long before, I believe it’s in the year 482, the silver mines in the south of Attica had yielded an unusual strike. A vein of silver had been discovered that was much more than normal, so much so that something had to be decided by the Athenian assembly. What should we do with the silver? It’s a wonderful insight into the way Greeks thought about theirpolis. The first thought, the one that was most popular to begin with, was well, let’s take the silver and divide it up equally among the Athenians. That in some sense the polis was a kind of joint stock company and when there was a nice dividend you just dole it out to the investors. Themistocles thought otherwise. Themistocles was — it’ evident — was constantly aware of the threat from Persia and of the importance of getting ready to fight the Persians, and he understood I think before most other Greeks that the navy was going to be really critical in this operation. So, he made the suggestion that the silver strike be used to build a whole fleet of new ships for the Athenians, and they end up with two hundred triremes, which is, the trireme is the battleship of the ancient Greeks. So, that is the core of the fleet which is the one that defeats the Persians at Salamis and defeats them again at Mycale. 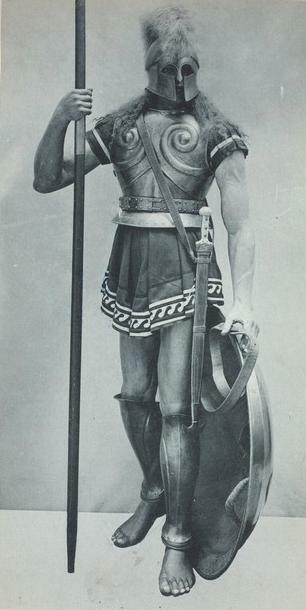 The Spartans were given command of the war against Persia, both on land and sea, but the Spartans didn’t have any great skill or experience in naval matters, and the Athenians had more than they, and it was the Athenian portion of the fleet, which was the largest and the most effective in fighting those naval battles. And, of course, the battle of Salamis was fought in Athenian waters and Themistocles, with his clever devices, had come up with the way of winning victory. First of all, compelling the Greeks to fight at Salamis and then winning the victory at Salamis. Now, the point of all this is one of the changes that has come upon the Greek world as a result of this Persian invasion, is that there is something new in the Greek world, a big Athenian navy, and it has proven itself already to be an extraordinarily capable navy. That is a new power factor, and the whole idea of naval power, being very decisive in Greek affairs is a relatively new idea. That’s not to say that there weren’t states that had navies before and naval battles, and in some cases that these were very important. But we’re really at another level after the Athenians have built this fleet and had the success that they had. Another consequence of the war was of course the tremendous boom that came in Greek self-confidence. I can’t emphasize enough what an incredible upset this was. No one would have imagined that, if the great king got really serious and sent over an army of a hundred or two hundred thousand, nobody knows exactly how many — Herodotus’ numbers are, it is widely agreed, exaggerated, but it’s a very big army and a very big navy, certainly it outnumbers the Greeks in both cases. Anybody would have thought it was going to be an easy victory for the Persians. To defeat that meant an enormous amount and the Greeks came away feeling that their general prejudice over their own superiority over everybody else had been justified by their performance in the Persian Wars; the Athenians, no less, of course, because of the very central role that they had played. So, all of these are new things that are in the hearts and minds of the Greeks and by no means are trivial. There was a sense that the Greeks had something remarkably glorious, not to be forgotten, which made them proud and made them, I think also, rather ambitious to continue in that course. Finally, one other point that I would want to make and that is, this is the first great panhellenic activity, really. There had been some sense in which the Greeks were increasingly aware that there was something called Hellenes, Greek peoples different from people who were not Hellenes, and this probably took shape most fully when they competed in the major athletic contests at major religious festivals in which they were fundamentally Greek even though it — well, they were entirely Greek, really. So that would have fostered this sense of panhellenism, but nothing could have given it the tremendous boost that it got like this victory of these thirty-one states that had banded together to defeat the Persians in that war. So, panhellenism is now on the horizon. I don’t mean to say that the Greeks are shaped now into a single people, have retreated from their localism and their love for their polis; nothing could be further from the truth, but alongside of their love of autonomy and love of their polis, there was the idea that panhellenism was a good thing. It had a kind of a nice ring to it. It’s the sort of the thing that I feel some familiarity with. Not that I was around right after the First World War, but reading about it, you realize that there was some sense after that war that the victorious peoples had something in common, and that in any case they could work together to achieve international peace in a way that hadn’t been thought of much before. But even more strongly, I think the idea after the Second World War, when this idea took even stronger roots to the point where you know people have this quasi-religious feeling, at least some of them do, about the desire to avoid having parochial national interests, determined what you’re going to do in international relations. Everything has to be done somehow as though there were a world government that really existed and really managed things, and although everybody knows that’s not true, it’s thought to be bad form to face that fact. Well, something like that kind, not as bad as that, but something like that kind of unreality was in the minds of Greeks, because you will be hearing over the next century various thinkers and speakers, who want to make the case that a thing is good if it’s somehow panhellenic, that’s a fine thing. So it’s an idea that’s there, not that any state, any more than our nations have given up any sovereignty or any independence, or any autonomy. It’s an idea and that’s all that it is.